Africa was probably the place where people first built any kind of building, because people lived in Africa before they lived anywhere else. But those early huts didn’t last. 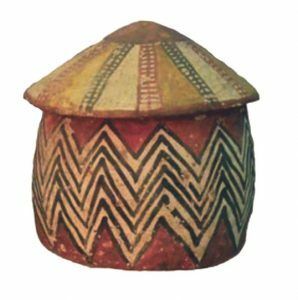 The first buildings we know about are from Egypt: small stone tombs known as mastabas, built about 3000 BC. Egypt was first, because Egypt was the richest part of Africa, where trade with West Asia was easiest. 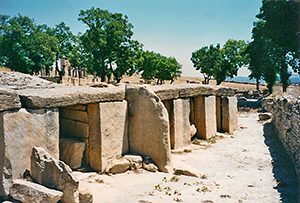 By 2000 BC, people, maybe migrants from Spain and Italy, were also building stone tombs all across North Africa. By that time, the Egyptians had moved on to building pyramids. The Egyptians started building the Pyramids about 2600 BC, when the Pharaohs first became rich enough to feed the huge numbers of people who must have worked to move all that stone. Nobody knew how to build walls and columns that would hold up a heavy roof yet, so the Pyramids are solid stone: that’s the easiest way to build something big. A thousand years later, trade and wealth were spreading further south. 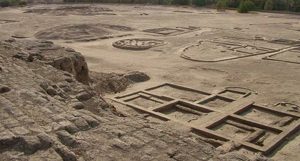 African kings and queens in Nubia (modern Sudan) built mud-brick palaces at Kerma. They couldn’t afford to build in stone yet, but they could build in mud-brick. The buildings at Kerma have many rooms, and show their designers experimenting with circular buildings and rounded apses. Meanwhile, ordinary people in Kerma – and probably in a lot of other places in Africa too – were living in round houses with one big room. These houses, like many houses in Europe at this time, were built of wattle and daub – branches woven together and covered with thick mud, and then whitewashed or painted. The roofs were generally thatched. Why do people whitewash their walls? Most people lived in houses like this one, in a village with ten or twenty of these houses arranged around an open space where people could hang out and keep their goats and donkeys. In cold weather, people could build a fire inside their house, but usually they cooked outside too. By about 2000 BC, architects in Egypt learned how to build temples using columns. At first they built temples of wood, with tree trunks for columns. Later they figured out how to make imitation tree trunks out of stone. Even the stone temples temples generally had wooden roofs, so that the roof would be lighter and the columns could hold it up. These were more expensive than mud-brick, but much cheaper to build than pyramids, because you didn’t need so much stone. 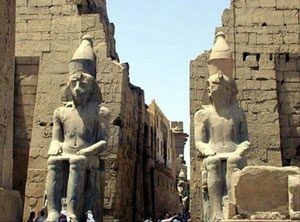 Egyptian pharaohs built many temples and palaces during the New Kingdom, around 1500 to 1200 BC. Learn by doing: build a sand castle pyramid. Cite this page: Carr, K.E. African Architecture. Quatr.us Study Guides, May 18, 2017. Web. April 23, 2019.